Seagate is looking to break records with two enterprise SSDs they're showing off at Flash Memory Summit this week. The first drive is one that's been seen before: the 10GB/s PCIe x16 SSD that Seagate demonstrated in March. It has now been named the Nytro XP7200 and is scheduled for mass production in Q4. Based on four Nytro XM1440 M.2 SSDs under one heatsink on a full height expansion card, the XP7200 is more of a backplane than a drive on its own. Unlike some other multi-controller PCIe SSDs, the XP7200 does not include a PCIe switch chip. This means that the card can only be fully utilized in PCIe x16 slots that support operation as four separate x4 links. Plugging the XP7200 into a PCIe x8 slot would render two of the four M.2 drives inaccessible. And because there are four independent NVMe SSDs on the card, hitting the peak advertised read speed of 10GB/s requires the use of software-based RAID-0 or a similar striping scheme. The performance specifications of the XP7200 show clearly the impact of using the capacity-optimized XM1440 models rather than the endurance optimized versions. Despite boasting total sequential read speeds of 10GB/s and almost one million IOPS for 4kB random reads, the write performance isn't earth-shattering. The XP7200 will be available in capacities of either 3.8TB or 7.7TB, as a result of populating it with either the 960GB XM1440 or the newer 2TB model. With the Nytro XP7200 moving toward production, Seagate has brought out another SSD tech demo with eye-catching specifications. The unnamed SAS SSD packs 60TB of 3D TLC into a 3.5" drive. 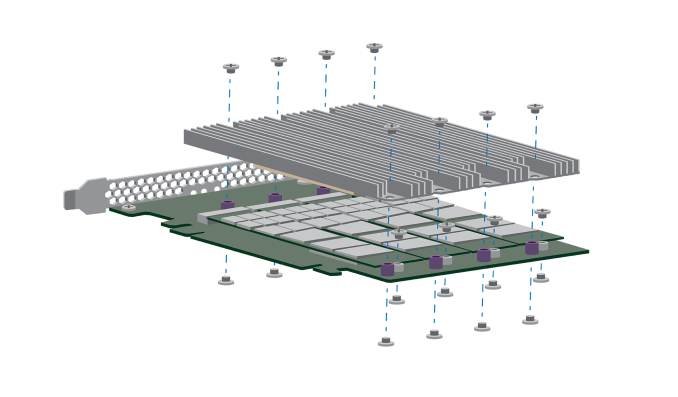 In order to connect over a thousand dies of Micron's 3D TLC NAND to a single SSD controller, Seagate has introduced ONFi bridge chips to multiplex the controller's NAND channels across far more dies than would otherwise be possible. The rest of the specs for the 60TB SSD look fairly mundane and make for a drive that's better suited to read-intensive workloads, but the capacity puts even the latest hard drives to shame. The 60TB SSD is currently just a technology demonstration, and won't be appearing as a product until next year. When it does, it will probably have a very tiny market, but for now it will give Seagate some bragging rights.